I love most anything with avocados. Anything with pico de gallo. With cornbread. Cilantro! Eggs…soft poached…not a fan, in the least. Nor am I a huge fan of breakfast! But this recipe did it for me! A fave breakfast restaurant of mine here makes something similar and I ADORE it! I made this last summer but certainly will be making it again soon! I was completely stoked to slice my little fork through this beauty! And it taste certainly stood up to its visual splendor! If you make your pico de gallo ahead of time, things are a lot less chaotic in the kitchen. Especially because there are several different elements that are being cooked/prepared simultaneously. Add all ingredients for pico de gallo and gently stir to coat with the lime juice. refrigerate until needed. While the cheese is melting I start my making my pancakes by placing the cornmeal, flour, salt, sugar, and baking soda in a bowl. In a seperate bowl mix all wet ingredients milk and eggs. Add wet ingredients to dry ingredients then stir in melted butter. Pour batter on lightly greased pan or griddle. Flip when bubbles appear. While pancakes are cooking you can start to fry your chorizo in a pan. Chorizo usually is a pretty fatty meat so you won’t need to add any oil. You can drain this in a colander if you like. Fill an additional pot with 3 inches water and bring to a boil. Crack your eggs into a bowl and then using a spoon, gently add eggs to the boiling water, then remove from heat and cover. 4 eggs for about 7 to 8 minutes. Remove with slotted spoon. Now were ready to assemble!! Place your pancake on plate, top with maybe a 1/4-1/2 cup chorizo, place an egg or two on top of the chorizo. Now you can pour your melted white american cheese on top of this. 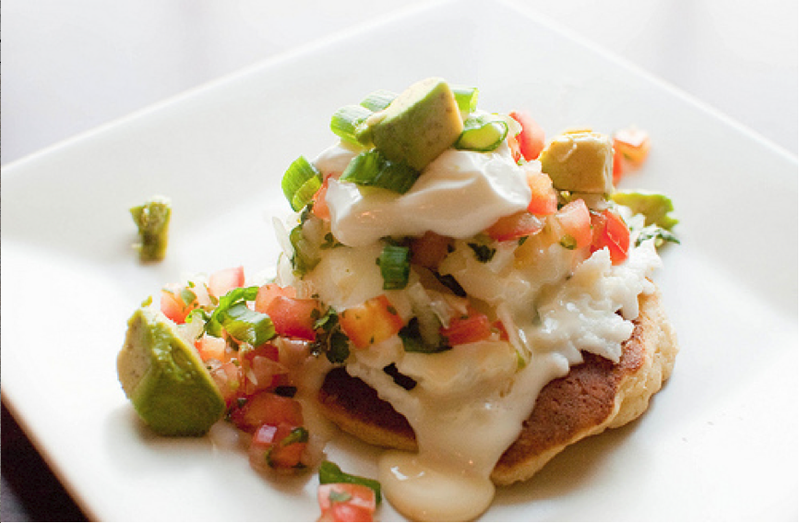 Sprinkle top with 1/4 cup of the pico de gallo and top with a dollop of sour cream and diced avocado! Voila!